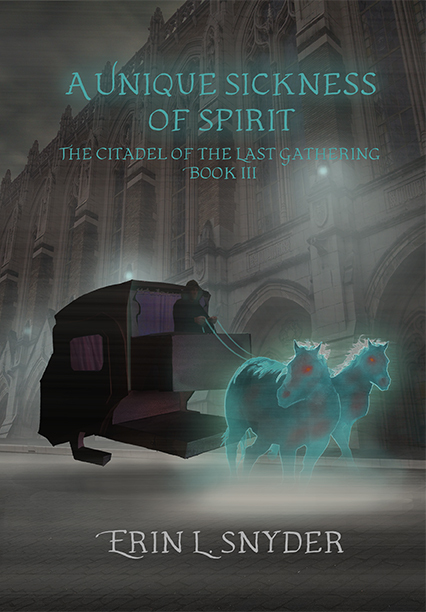 We're still working on getting the third novel in The Citadel of the Last Gathering ready, but I just finished an early version of the cover image and wanted to share. This isn't finalized - I've got a few more adjustments to make - but I'm extremely happy with how it's coming together. Incorporating elements of Victorian horror and steampunk, A Unique Sickness of Spirit begins just moments after the conclusion of A Tide of Ice. Alaji, Yemerik, and Phaesha arrive in a time very different from the one they left. Here, ships sail through the air, the lines between the living and the dead have blurred, the poor sell their very blood and spirit to survive, and a nation at war is splintering into factions. Alaji finds herself becoming a symbol for revolution, whether she wishes it or not. A Unique Sickness of Spirit will be available in fall 2016.